I’d love to be kept up to date with the seaweed capsule progress also. I’m yet another psoriasis sufferer and would be very interested in trying these out. in the mean time, what is a good type of seaweed to add to general food? I have signed up on Phycohealth to the e newsletter, I’m just wondering if there was any other place for information. Please add me to your list of people who wish to purchase your seaweed capsules. Like some of the others, I suffer with psoriasis and psoriatic arthritis and am keen to try these. I have signed up on Psychohealth to the e-newsletter and like Molly, I would be interested to have any other information on this. Daneen, can you please stop spamming this forum, particularly given the fact that your seaweed is high in iodine. A few answers here and apologies for not keeping up with queries. Zarbazan – most Nori has a low but good amount of iodine. You could eat about 10g per day of the commercial nori that we have tested from Asian food store shelves, and still stay well below the recommended upper limit of dietary iodine. In contrast, 10g of kombu would put one person over 30 times above the upper limit for dietary iodine. Kombu is still a great seaweed to eat in tiny doses like in salt blends to provide iodine but you only need mg’s of it. The irony of iodine is that most populations are still deficient in it; it is vital for brain health and hormone function, but we only need a tiny amount through our whole life, all the time. We work with an Australian green seaweed that has even lower concentration of iodine than nori so that the dose can be increased for other nutritional components, including the dietary fibre, without risking high levels of iodine. In Australia we are looking to establish improved best practice around the species labelling and nutritional information of seaweeds for sale. I have even seen kombu for sale in Australia identified as nori – this would not be good for anyone sensitive to iodine and so these issues need to be addressed. But as long as your medical practitioner has not identified that you cannot eat iodine in relation to your thyroid concerns, then nori is a safe choice to eat regularly, if sourced from a clean ocean area. Just found this topic, my wife suffers from multiple sclerosis, which is another inflammatory auto-immune disease. Have any MS sufferers been included in the trial? 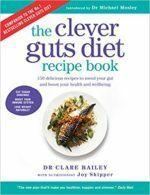 In addition to our clinical study participants, many people have contacted me directly and expressed their improved condition since simply being focused on their diet more and following Clever Guts approaches to food. This is great and hopefully with seaweed available now in a form that is easy and accessible in concentrated doses without too much iodine, this can be a part of your regime. It is wonderful that people can start to take charge of their health and learn for themselves what is working for them – we all have a unique gut and unique ways to improve it.